For a quick and easy-to-make treat, why not try this delicious sandwich. I always top with bioSnacky® Little Radish sprouts for a nutritious boost. Courtesy of A Vogel recipe page. 1. Spread the slice of wholemeal bread with coconut butter and/or a sliver of miso paste. 2. Place organic lettuce/rocket leaves on top. 3. Add a dollop of cottage cheese. 4. 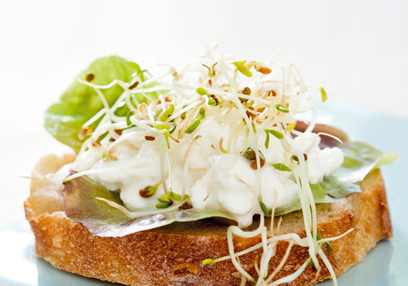 Top with delicious freshly sprouted bioSnacky® Little Raddish sprouts.